From Auto123.com: Saturn's big family hauler hit the road for 2007, just a few years before the demise of the GM-owned brand. Packing room for up to eight, and riding the same platform as the Chevrolet Traverse and GMC Acadia, the Saturn Outlook packed standard V6 power, plenty of size, available AWD, and a long list of available feature content. 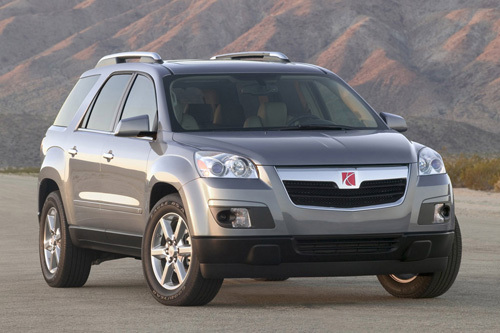 General Motors is recalling 1.5 million 2007-09 model cars, trucks, and crossovers to disable a heated washer fluid system (HWFS) module that could pose a fire risk. Because the feature will be disabled, GM will make a voluntary payment of $100 to the owner or lessee of each vehicle. There are no known injuries or crashes related to the condition. I said in the past I wold not buy another, but I just went ahead and purchased my sixth Saturn: a new 2008 Astra 3 door XR with 8873 miles. It was never registered and I will be the first owner. Yes, it is 2010, but this car was priced right and I had to either replace my Ion or start putting money into it, as it is 6 years old and has 93 thousand miles. I was car shopping and found this treasure. Published dimensions indicated for the 2010 Saturn Vue are without optional equipment or accessories. Additional accessories or equipment ordered at the customer's request can result in a minor change in these dimensions. All dimensions in inches (mm) unless otherwise stated. With all of the media attention over the past couple of years focused on Saturn's redesigned lineup of vehicles, it's easy to forget about some of the company's other initiatives and innovations. Saturn has always been known for outstanding customer service, and the brand works hard to stay at the forefront of the industry when it comes to coddling customers. There are currently 9 users and 387 guests online.